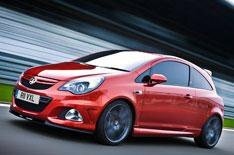 Vauxhall Corsa VXR Nurburgring Edition | What Car? A faster, more-focused version of Vauxhall's Corsa VXR hot hatch. Tweaks to the punchy 1.6-litre turbo engine lift power from 189bhp to 202bhp, and maximum torque from 196lb ft to 207lb ft. The result is 0-62mph in just 6.5 seconds (down from the standard car's 6.8 seconds) and a top speed of 143mph (up from 140mph). To help the VXR Nurburgring make the most of its extra firepower, Vauxhall has fitted a traction-enhancing limited-slip differential. This is complemented by new springs and dampers, a lowered ride height and lightweight Brembo brakes. What's it live to drive? Accelerate out of a slow bend in a regular Corsa VXR, and you have to be careful not to spin the front wheels. By contrast, this Nurburgring Edition piles on speed cleanly thanks to that new diff. You'll be just as impressed in fast corners because the car sticks to your chosen line like it's been superglued there. What's more, body movements are always tightly controlled and the steering is sharp and consistent, if not exactly full of feel. The one question mark is the ride: our drive took place on a smooth test track, and the UK's patched up roads will provide a much tougher test. The VXR Nurburgring might offer thrills, but they don't come cheap. At 22,295 it costs 3395 more than the regular Corsa VXR and 5485 more than a Renaultsport Clio Cup. In fact, it's just 1725 less than our reigning hot hatch of the Year, the 247bhp Renaultsport Megane Cup. Average fuel economy is a respectable 37.2mpg, although this will obviously plummet if you use the VXR Nurburgring the way its maker intended. Great fun. We just wish it was a bit cheaper.